Pizza Diavolo, originally uploaded by Camemberu. We felt like a bit of Italian tonight but didn't want to travel far. Chose Al Forno, even though we know the original owners have sold out some time ago and gone on to form Artz Pizza/Baraonda. 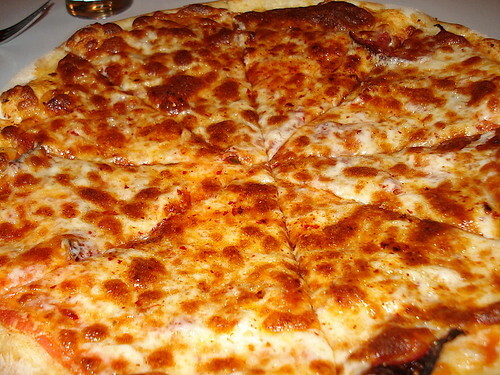 Well, we remembered a nice pizza diavolo (S$21) there - just salami, cheese and chili. But this time it wasn't as nice as we remembered. Less cheese (or poorer quality), and not as spicy. Hubby still enjoyed it but I thought it was mostly just salty. Spaghetti Alio Olio Peperoncino, originally uploaded by Camemberu. 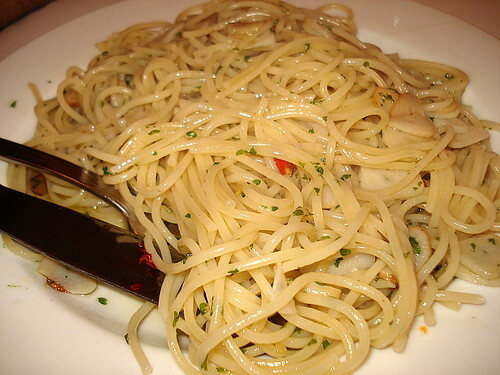 Hubby's aglio olio was disappointing. Too bland and portion too big for something tasting so flat (guess they just threw in more noodles to justify the $18 price). We requested for it to be really al dente, but it came as Singaporean style al dente (i.e. still too soft). Next time, we'll just make it ourselves at home. 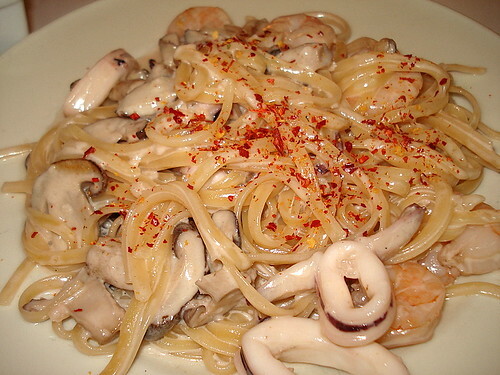 Linguini Mare e Monte, originally uploaded by Camemberu. Don't you just hate it when you feel full after a meal but not happy? All in all, it was the dumbest S$90 we've ever spent (after a beer, Coke and +++). I don't think we'll be back anymore. Tel: you sure you wanna call? I spend almost $70 at Pawtobello (A doggie friendly place at Mohd Sultan) for lousy food too. Medium rare ribeye that tasted like tough sirlion that was cooked well done. At least the tea there was served in "fine china" and tasted decent. The dogs were happy too.